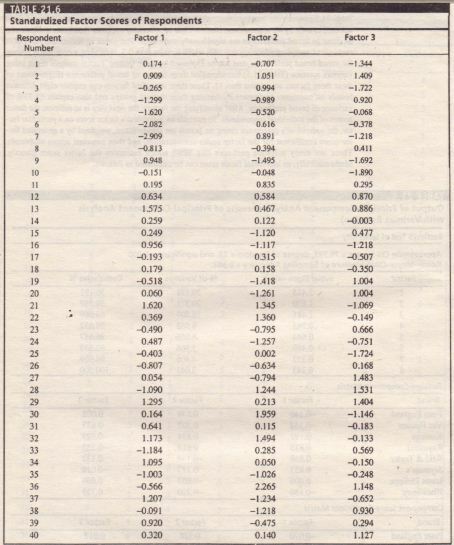 Factor analysis can also be used for preference mapping of respondents for a set of alternatives. Factor analysis-based preference-mapping technique facilitates marketers to understand the competitive structure of their markets. Based on the insight obtained from the map, they can position their offerings to achieve a favorable response from their target segment. A preference map differs from a perceptual map by a way in which the attribute-based similarity, either derived or stated, ratings of respondents are obtained, and then consumer perception about these attributes are mapped. 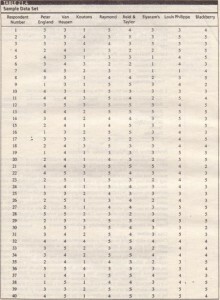 In preference mapping, the preference responses for each brand or alternative are obtained and these preferences are mapped. Such preference map allows the identification of consumer-preference positioning for various alternatives (brands). Table 21.5 presents the detailed principal-component-analysis result of preference rating of eight selected brands by 40 respondents. 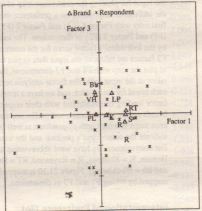 Bartlett’s test of sphericity suggests that factor analysis can be done as brand preferences are significantly correlated. The value of Kaiser-Meyer- measure of sampling adequacy is 0.583, which is more than 0.5, indicating a correlation among the slated brand preferences, and can be explained by some factors. 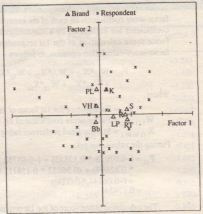 Factor-analysis result using varimax rotation (Table 21.5) has identified three factors of brand preference (Eigenvalues of these three factors are greater than I). These three identified factors can explain eight different brands on consumer preference by forming three distinct groups and also explain 65.73% of variance of brand preference. 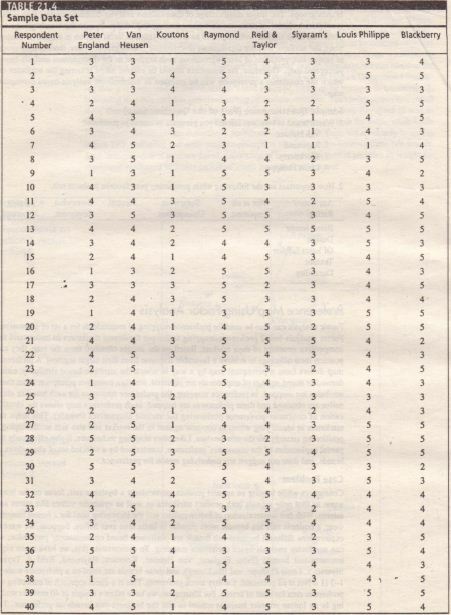 After identifying the factors, the next step is to estimate the factor scores of the individual respondents. 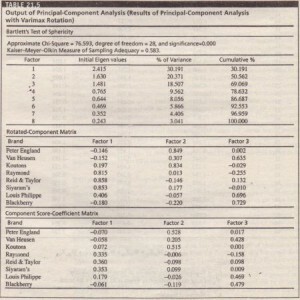 To estimate an individual’s factor score on a particular factor, the individual’s preference rating on brands are standardized, weighted by a generated factor score coefficient for “the factor under consideration, and then summed across all brands. 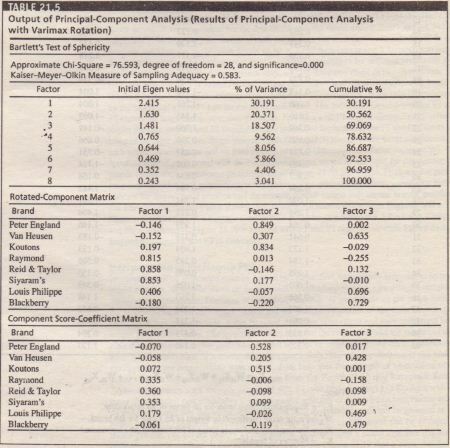 individual respondents lay around Raymond, Reid & Taylor, and Siyaram’s brands (Factor I). This indicates that a larger percentage of respondents strongly prefer the above three brands. 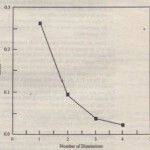 Similarly, the plot with Fl and F3 dimension (Figure 21.11) can be interpreted. While making an inference of maps, an analysis of both the plots must be combined to make any informed decision about a brand.